I became a fan of Sarah's through her Tumblr so needless to say I was very excited to find out to she had a book published. I really enjoy her sense of humor and view of the world. She is an introverted bookworm with her pet bunny who tries to make it through everyday life. She tries to take on relationships, standards of beauty and the joys being a girl. Give a try, you won't be disappointed. When I read the first few lines of the back of this book, I was already sold. These comics are for the twenty-something introverts still trying to figure the world out. With situations ranging from spending habits to seeing that dreaded photo a friend tagged you in on social media, Andersen manages to capture the seemingly mundane happenings in life and make them hilarious. 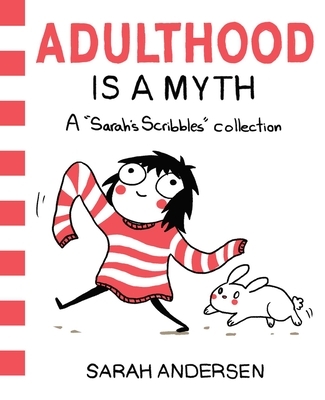 Perfect for fans of Allie Brosh's Hyperbole and a Half, Adulthood is a Myth is a must read!